Yoga is my favorite form of exercise. Husband thoughtfully gave me a better and slightly thicker sticky yoga mat so I didn’t have to borrow his mat anymore. Awww. What a guy! He offered to buy me a new yoga mat bag too. I told him I had all of the materials I need in my craft room to make a yoga mat bag. Three months later I finally got around to making it. 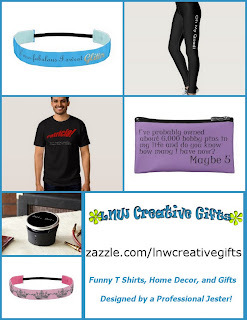 My bloggy friend Jen Goode from 100 Directions asked me to be part of her National Craft Month celebration. Jen’s blog collaboration was the kick in the seat I needed to design and sew the yoga mat bag I planned from recycled and stash bust craft materials. 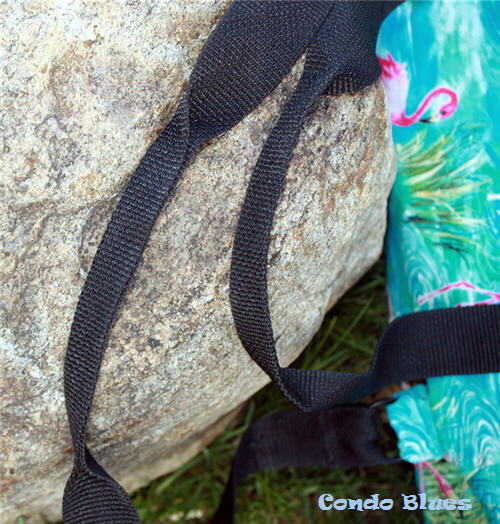 I like Husband’s cotton zippered yoga mat bag because it is more forgiving if I don’t roll my mat perfectly tight than a drawstring yoga mat bag. It has an outside zipper pocket that’s perfect for my keys and phone. I want something a little bigger to hold toiletries when I shower at the gym after class. 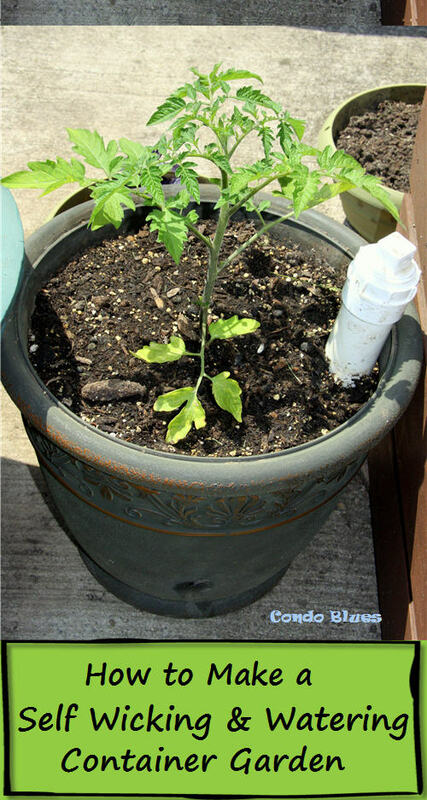 I added affiliate links to this post in case you are interested. I like the size and shape of the Giam Marrakesh Yoga Mat Tote Bag and considered buying it but doesn’t zip closed. 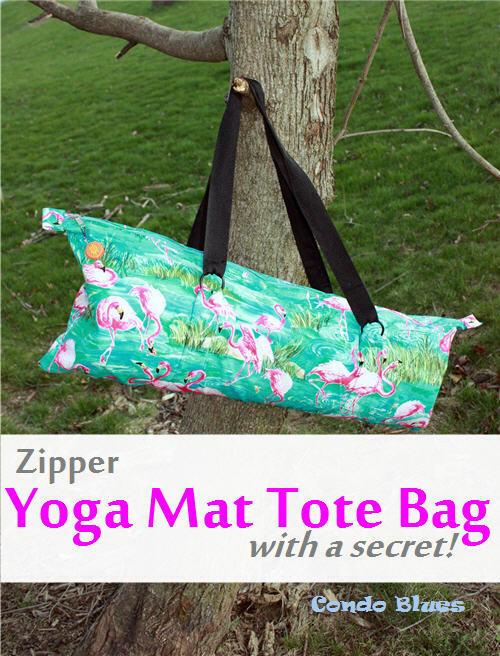 DIY a yoga mat bag craft mash up of course! I measured my yoga mat and based the design the Marakesh mat bag and Pattern Pile’s Sew an EASY Yoga Tote – Free Tutorial. 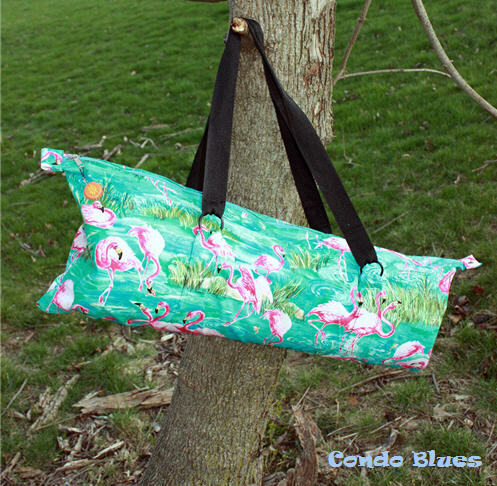 I used Pattern Pile’s tutorial to sew the outside of the yoga mat bag. 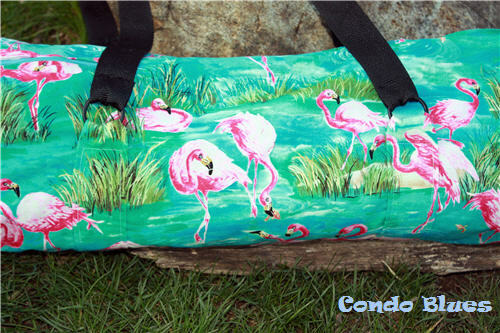 I’ve been hanging onto this flamingo fabric waiting for the perfect project to come along. Cutting and matching the print on the lower bag straps was tricky and took extra time but the result is worth it. I used curtain rings to mimic my favorite design feature of the Marakesh tote bag. I made the tote bag handles from the webbing on a child’s safety harness. I hoped the black handles would tie into the black in the fabric. I’m a little unsure about them. What do you think? I might change the color later. I folded and sewed the center section of each handle to make the handle grip. 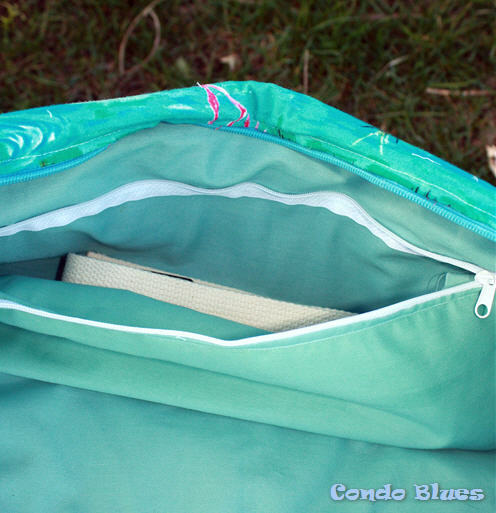 I used Color Girl’s Simple Zippered Tote Tutorial to line and add the zipper to my yoga mat bag. I added a wide internal patch zipper pocket for my yoga strap, dance shoes, and whatnot. Sewing Tip: My source for cheap zippers is to cut the zipper from plastic packaging bags (curtains, bedding, etc.) when they cross my path. They aren’t the highest quality zipper to use when I sew clothing but work great for tote bag or pouch sewing projects. 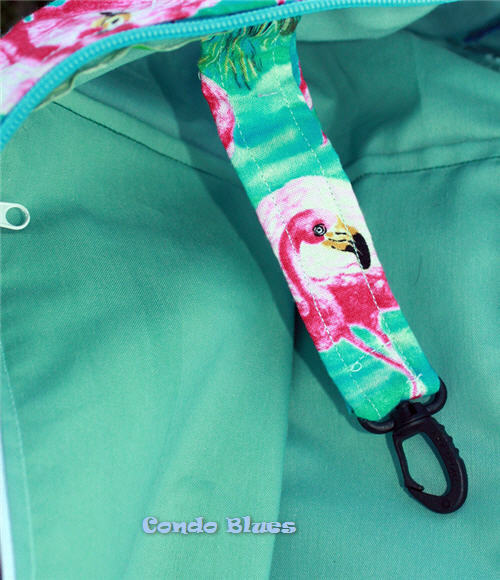 I added a DIY zipper pull for sunny fun. 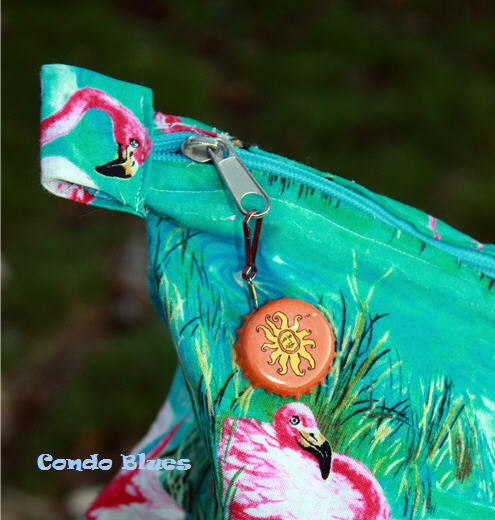 Read my simple bottle cap zipper pull tutorial on Condo Blues here! The bigger the purse, the harder it is to find your car keys in the bottom of it. I solved that problem by making a tote bag key strap from a conference badge hook. You can buy swivel hooks from Amazon if you don’t have extra lanyards hanging around. Lastly I loaded up my lined yoga mat bag with stuff and zipped off to class!